Women Walking Tall is an Oakland, California based outdoor performance stilt walking project, conceived in 1991 by Terry Sendgraff to celebrate women's impowerment. This project included over two hundred women of all ages, backgrounds and cultural traditions. Classes were offered in stilt walking and construction, costume and maskmaking. Women Walking Tall's most outstanding performances included three consecutive years in Oakland's Lake Merritt Park, '91, '93, and Sendgraff's full evening concert Conference, at Laney College Theater in 1993. The Organization continues activities as a non-profit arts organization, under the guidance of Shawn Dubin. Dance Kaiso, founded in 1987, first appeared in Carnaval San Francisco in 1988--a small group of percussionists and dancers wearing raffia and leopard. In subsequent years, Robbin and Wilfred played Carnaval, first with the group Mas Makers and then with All Ah We. In 2002 they were back with their own contingent. Dance Kaiso's Bat Mas won several awards that year. In 2003, 60+ students joined 70 adults to play Carnival. Their theme: a "Mass Affirmation of Peace," aka "Make Art, Not War!" DANCE KAISO 2005 contingent dancers‹in red, black, and white, representing the Republic of Trinidad and Tobago‹perform a calpyso to live drum and percussion music. They are joined by students from Sanchez Elementary and Meadows-Livingstone Schools and stilt walkers from Women Walking Tall. WILFRED MARK, a native of Trinidad, was a principal dancer with Repertory Dance Theatre of Trinidad and Tobago for eleven years and a dancer/actor with the Derek Walcott Theatre Company for four years. Wilfred has taught on the faculties of San Francisco State, Sonoma State, and Stanford Universities. 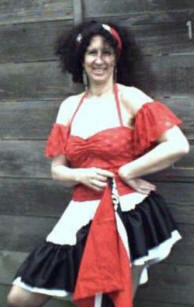 ROBBIN FREY studied Haitian dance with Jean-Leon Destiné in New York and Trinidadian folkloric and jazz fusion styles with Astor Johnson in Port-of-Spain. 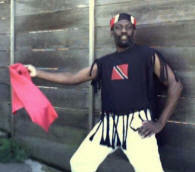 Robbin has a Master's degree in Dance Ethnology and has been teaching and performing Caribbean dance since 1983. For information on Dance Kaiso, contact Robbin Frey or Wilfred Mark, voicemail: 415/282-9620; email: dkaiso(at)earthlink.net.